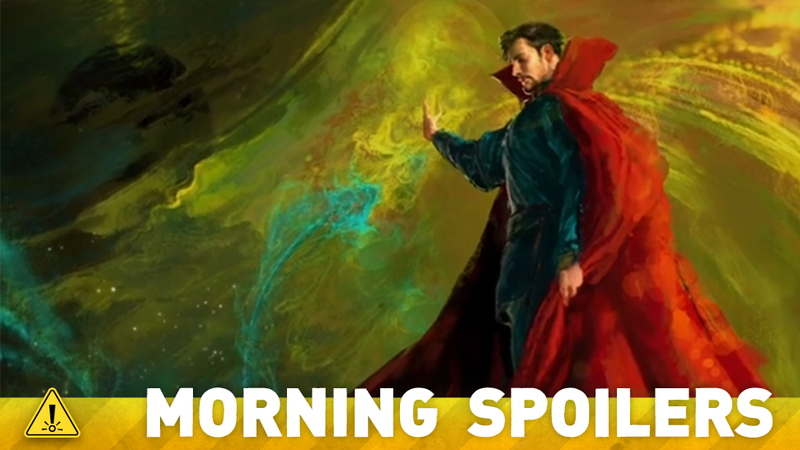 A New Doctor Strange Set Picture Teases Some Major Marvel Mysticism! Is there more to Batman v Superman than everyone thinks? And will The Force Awakens include a tease for Rogue One? Jennifer Lawrence talks turning blue for X-Men Apocalypse. Plus more from Deadpool, Charles Dance talks Childhood’s End, and a new look at The 100’s third season. Behold, Spoilers! Marvel co-president Marvel Louis D’Esposito took to twitter yesterday to post the first “official” picture from the set of the film. While there’s nothing in terms of a look at the characters—no sign of Benedict Cumberbatch’s costume in sight—but just over the shoulders of Stephen Broussard you can spot two important icons from the Doctor Strange mythology: on the door, the seal of Vishanti, the symbol of the school of magic Doctor Strange is taught in by the Ancient One in the comics, and on the platform, the eye of Agamotto, the amulet that Strange uses to dispel magical illusions and glamours. There’s been speculation that this could be Doctor Strange’s Sanctum Sanctorum, his magical home in New York, but given recent filming in Nepal, it’s possible that this is the temple of the Ancient One. I am blue in it, a little bit. I put my foot down as much as I could. But they were very, very nice to me. Production designer Patrick Tatopoulos discusses Doomsday’s role in the film, saying that fans feeling like the most recent trailer spoiled too much have seen nothing yet. UPDATE: It seems like this interview may be a fake, as the French magazine Premiere, where the original interview allegedly came from, claims to know nothing about it. Hat tip to Futureprobe1982 in the comments, and apologies for the confusion! Doomsday is an evolution essentially… Fans may be aware of the ‘Death of Superman’ story, but this is handled in such a new way. When the film is called ‘Batman v Superman’ it really has a lot of levels to the meaning. Superman isn’t just killed off at the end of something. We see how he evolves as part of Lex’s plan to protect the world. Seeing the Superman we know, be gone, and then replaced with this reproduction is really going to make fans think of how we look at these super beings. It was especially interesting to figure out, how would you create Superman from Zod… then how would that involve into Doomsday. The timeframe of how things fall into place will surprise fans. Doomsday isn’t just the final act. Those feeling they may know too much this early are going to be in for a true surprise. CBS has released extra footage of their 60 minutes Force Awakens special, featuring the music that opens the movie immediately after the opening crawl. Kylo Ren shows off some swish lightsaber moves in another promo. There’s a teeny smattering of new dialogue and footage in this new international trailer for the film. Here’s Ryan Reynolds promoting the “12 days of Deadpool”, a countdown to the release of a new trailer on Christmas Day. This was written in 1952, talking about a world of economic crises, wars, famine, here we are in 2015 and nothing’s changed. I thought there was a lot of resonance for us now, which was reason enough to do it. Exposition is a killer, it’s deadly. Whenever a television show or a film resorts to exposition, it’s because there are major flaws in the script. This doesn’t resort to exposition. Finally, here’s a new, war-and-romance-filled trailer for the show’s third season. Additional reporting by Gordon Jackson and Charlie Jane Anders. Image: Doctor Strange Concept Art.